This volume contains a chronicle, and several works composed by John of Wallingford, written in his own handwriting. He became a monk of Wallingford (between Oxford and Reading) in 1231, moved to St. Albans in 1246/7 where he was in charge of the infirmary, and moved again c.1257 to Wymondham, a cell of St. Albans, where he died in 1258. Parts of the manuscript were written and illustrated while he was at St. Albans, but other parts date to the final year of his life, when he was at Wymondham, a few miles south-west of Norwich. The style of the drawing and handwriting on this page are those of Matthew Paris, the famous monk, artist, and chronicler of St. Albans Abbey, who died in 1259. He was therefore a contemporary of John of Wallingford, and must have known him well. 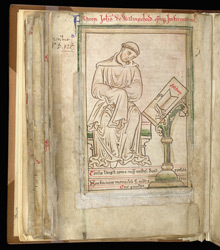 The caption in red at the top of the page reads 'Brother John of Wallingford, one time infirmarer', and the book on the lectern is labelled 'Psalter'.